Every Tuesday Diane at Bibliophile by the Sea hosts First Chapter First Paragraph Tuesday Intros to share the first paragraph sometimes two, of a book that she’s reading or planning to read soon. Diane is having a summer break at the moment, but I enjoy doing this meme anyway. 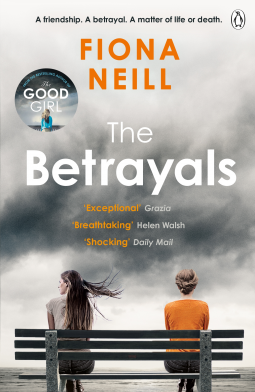 This week’s first paragraph is from The Betrayals by Fiona Neill, which was published on 10 August. Three is a good and safe number. I close my eyes and whisper the words three times so no one can hear. They sound like a sweet sigh. If Mum notices she might worry and the days of worry are over. I say this three times too, just to make triple sure, remembering how the words have to be spoken on the outbreath. None of them would forget that week on the wild Norfolk coast. Best friends Rosie and Lisa’s families had always been inseparable. But that summer, Lisa had an affair with Rosie’s husband Nick. And now, after years of silence, she sends Rosie a letter begging for help. A letter which exposes dark secrets. Daughter Daisy’s fragile hold on reality begins to unravel. Teenage son Max blames himself for everything that happened that long hot summer. And Nick must confront his own version of events. There are four sides to this story. Who will you believe? I was captivated from the beginning of this book right to the end. My review will follow shortly.